MIZAR (Zeta Ursae Majoris). One of the most famed stars of the sky, second magnitude (2.06) Mizar, 78 light years away, is the Zeta star of Ursa Major, the Greater Bear, the second star in from the end of the handle of the Big Dipper, and the Dipper's fourth brightest star. In large part its fame comes from the coupling of the star with a nearby visual companion, fourth magnitude Alcor, only 11.8 minutes of arc (a fifth of a degree) to the northeast. The two, Mizar and Alcor, termed the "horse and rider" by the Arabians, are a good test of minimal vision. The star's Arabic name derives from a word meaning "the groin" of the celestial Bear that plods silently around the north celestial pole (the name mistakenly drawn from Merak, in the Dipper's bowl). However even without Alcor, Mizar takes its place in the celestial hall of fame as the first known double star, one that consists of a pair of stars that orbit each other. Found to be double in 1650, Mizar is a prime target for someone with a new telescope, as the components are an easy 14 seconds of arc apart (at least 500 astronomical units), the two taking at least 5000 years to make their orbit about each other. Mizar has the distinction of being the first-known double, the pairing discovered by G. B. Riccioli in 1650. The two white stars, 14 seconds of arc apart, are striking as seen through a small telescope. The apparent irregularity of the images is caused by turbulence in the Earth's refracting atmosphere (twinkling). The two nicely illustrate the dramatic decrease in luminosity that accompanies a small change in dwarf spectral class, from A2 (Mizar A, the brighter) to A5 or A7 (Mizar B), the result of a small decrease in mass. The two orbit with a period of at least 5000 years. Each is again is a close double, the components too close to separate here. Image courtesy of John Thomas. More remarkably, each of these two components is AGAIN double. The brighter of the two (magnitude 2.27) contains a very close pair a mere 7 or 8 thousandths of a second of arc apart (an angle made by a penny at a distance of 300 miles) that has an orbital period of 20.5 days; the fainter of them (magnitude 3.95) contains a pair with a period of about half a year. Mizar is thus actually a quartet of stars, a double-double. It is moving through space together with its more-distant companion, Alcor. 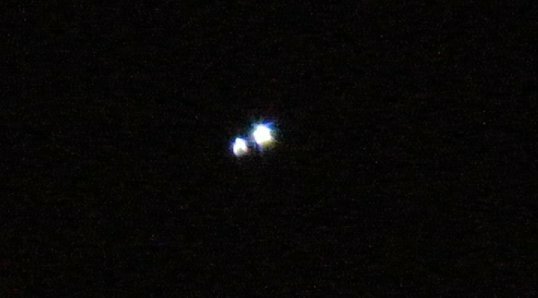 Mizar and Alcor together therefore probably make a quintuple star, Alcor taking at least 750,000 years to make a single round trip around its quadruple companion. All of the stars are similar, all "main sequence" hydrogen-fusing dwarf stars like the Sun, but of white class A (the brighter both A2, the fainter probably both A5 or A7) with temperatures ranging between around 7500 and 9000 degrees Kelvin and luminosities from 10 to 30 times solar. The orbit of the brighter double that makes Mizar has been observed with a sophisticated "interferometer" that makes use of the interfering properties of light. Analysis shows the component stars to have masses 2.5 times that of the Sun; the masses of the fainter pair are estimated at around 1.6 solar. The stars have odd chemical abundances as a result of slow rotation, which allows for quiet atmospheres and chemical separation. The brighter of the pair seen through the telescope is rich in silicon and strontium, whereas the fainter is a "metallic line star" that is deficient in aluminum and calcium but high in silicon and in rare earths like cerium and samarium. See Alcor for further discussion of multiplicity. Written by Jim Kaler 7/17/98. updated 7/03/00. Return to STARS.